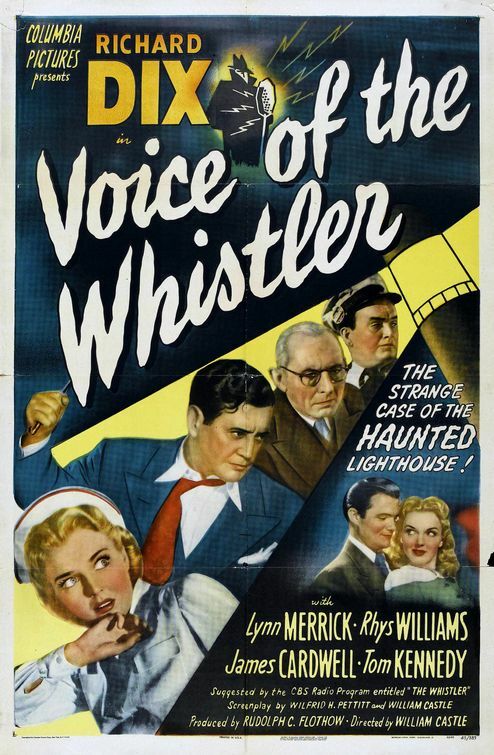 The Whistler, which was first heard on the Columbia Broadcasting System on May 16, 1942, ran for more than 13 years and was one of the best mystery and suspense programs on the radio. It didn’t feature the well-known Hollywood stars of Suspense (also broadcast on CBS), but its scripts were some of the most clever and intriguing that old-time radio had to offer, and its final twists were always satisfying, whether or not you saw them coming. The program was hosted by a mysterious character embodied only by the sounds of footsteps and an eerie, whistled theme song. Each program began the same way, with the narrator saying, “I am the Whistler and I know many things, for I walk by night. I know many strange tales hidden in the hearts of men and women who have stepped into the shadows. Yes, I know the nameless terrors of which they dare not speak.” There were no recurring characters, but the situations were fairly similar from week to week. Greedy or vengeful people driven by dark impulses endeavored to commit perfect crimes, but were undone by a single overlooked detail or their own overreaching. Quite often, each story would contain more twists than just the one at the end. For instance, one program from October 1945 told the story of a man who killed his underworld partner and got away with it. He always wanted to reveal to the police the details of his clever scheme, but of course could not do so and remain a free man. After inadvertently faking his own death when a drifter steals his car and identification, crashes, dies, and is believed to be him, he changes his name and moves out of town. He then writes a mocking letter to the authorities laying out all the details of how he got away with murder. Immediately after mailing it, he hears on the radio that the police have determined that the body in the car wasn’t him after all, so he goes on a furious chase through the state in an attempt to retrieve the letter. He eventually attracts the attention of the police for tampering with the mail and is caught and confesses, only to find out at the end of the program that his letter was returned to his boarding house because it had incorrect postage. Sinclair moves to the coast of Maine and takes up residence in a lighthouse that has been converted into a private dwelling. Believing he doesn’t have long to live, he convinces a beautiful young nurse named Joan Martin (Lynn Merrick) to marry him. In exchange for her companionship during his last months, she will inherit all of his wealth. Although Joan is in love with a handsome young intern named Fred Graham (James Cardwell), they have been engaged for four years, and have no plans to be married until Fred can make enough money. Against Fred’s protests, Joan marries John, partly because she likes him and pities him, but mostly because his money can give her and Fred the life they’ve always wanted. After John and Joan have been married and living in the lighthouse with their jovial friend Ernie Sparrow (Rhys Williams) for several months, John’s health dramatically improves, and it looks as if Joan might have trouble collecting on their bargain. Meanwhile, John falls more and more in love with her. Eventually Fred shows up for a friendly visit that will have murderous consequences. Richard Dix, a Hollywood star since the silent era, is great in each Whistler film I’ve seen him in so far. His glory days were behind him, but he was still a fine actor, and was equally adept at playing sympathetic protagonists and villains. Posted in 1945, October 1945 and tagged Allan Radar, Columbia Pictures, Donald Woods, Dwight Caldwell, Egon Brecher, Film Noir, George Meehan, Gigi Perreau, James Cardwell, Lynn Merrick, Mario Castelnuovo-Tedesco, Mystery, Rhys Williams, Richard Dix, Rudolph C. Flothow, The Mark of the Whistler, The Power of the Whistler, The Whistler, Tom Kennedy, Voice of the Whistler, Wilfred H. Petitt, William Castle. Bookmark the permalink.